Recipes fall under 5 categories: salad, soup, hors d'oeuvre, entrees, and desserts. At first, you'll only be able to make salads and soups, but after you've made a certain amount of dishes (around 23), two other categories will be opened up to you. 'Entrees' will come a little while later. 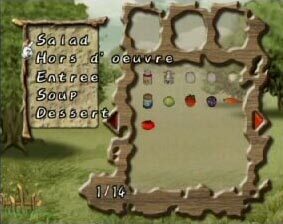 Once you have all the menus available, some people in the village will comment on how great of a cook you've become! To make a dish, you must first select the correct category for the dish. (e.g., if you want to make Sashimi, don't select Sweets!) Then you can use up to three items to make the dish you want. Root Vegetable: Carrot, sweet potato, potato, turnip, all special root vegetables (unconfirmed). Fruit: Orange, banana, peach, grape, apple, watermelon, melon, strawberry, all 2nd generation trees. Special Produce: Gretoma, melotoma, trady, tomaca, berrytoma, raury, cabber, dhilon, camelo, dyibe, kyaberi. Special Root Vegetables: Yamato, tobatama, kandy, cady, radita, kanro, bashota, tataro. Special Fruits: All 2nd generation trees, melober, kashry, berryber, bashber, sholo, beriro, potamelo, berryto, paberita.